Edgar Cayce said thoughts are things. He also said Mind is the builder. So not only what you say but what you THINK affects you, of course. And others. New Agey people often talk about “psychic attacks” and “emotional vampires” and stuff like this and I never felt it so keenly until recently and how the more good you do in the world, the more dark can surround you. A metaphor from my tradition: there’s something called the Yetzer Hara, the “evil inclination” and they often speak of it as something inside you, like a little devil whispering in your ear, but for my purposes here I’m speaking of it as an outside force. Kinda like a Mars transit. You can’t stop it. It comes at you. For better or worse. I think it’s more important than ever to protect yourself, using strategies, techniques. The internet is full of this stuff, like closing up your chakras for instance before going to crowded places. It’s daily maintenance that’s the hard part and with my North Node in Pisces in the 6th House being transited by… the Sun, Neptune, Chiron, and the New Moon soon… routines are… Well? Where are they? 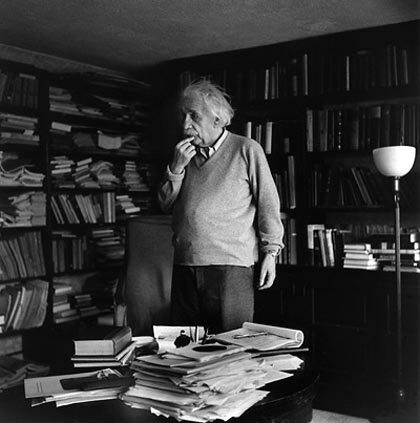 Look at Einstein’s piles of papers there in the picture. It’s beautiful, ain’t it? Something I did today which I found helpful is that I used a certain book from my tradition and it comforted me. The old language. The old words. I know some people need to leave the religion of their childhood behind. I dip in and out of mine but I do know that when I enter these books, I feel protected and that actually there is nothing stronger. I’m bringing this up during Pisces Season because it is a spiritual topic and a confusing or nebulous topic and it can be hard to know what’s yours and what’s from out there. But with Mercury in Pisces now heading to oppose Mars retrograde in Virgo? It’s a balance of the practical technique and routine of Mars in Virgo vs. the holy words of a Mercury in Pisces. You need both. And that’s what this Mercury/Mars opposition is to me: a holy book. Do you have one? Can you get one? Maybe you’ll write one. So for Pisces Season, consider adding in a new ritual, a new spiritual, that you want, that you think you may need, that you feel may protect you from the yetzer hara, outside or inside… because during Pisces Season our boundaries are paper thin. I used to be more of a positive thinker. I’ve had negative experiences come from positive thoughts, though. I had made the decision to not comment here until I was feeling okay, and stayed away from even reading the emails of your posts, until this evening, when I read one, and I saw that something had disturbed you. I was deliberately staying away, in case my emotions had been affecting you. I had brightened up until this evening (gone 7pm), and that was why I was reading your posts. My boundaries used to be so much stronger. I have been visualizing myself pulling my energy towards me, and pulling back myself. I hav e a book about rituals and celebrations, that I was supposed to work through with others, and a book on spells that I’ve been meaning to try in order to ward off any interlopers into my own energy. Last year, I was thinking about making my own, what do you call it? rosary. An angel version of a rosary, made by Silver Ravenwolf. I thought that it would help me to focus, and that was just before my cousin died. I’ve been cleaning up and clearing out. And last night I was looking at books by Shakespeare. I used to have a book of his plays, when I was twenty years old. I picked up some drawing pens, and am readingthe book I mentioned earlier. Angela, your emotions do not affect me – don’t worry. I enjoy your comments here. Sounds like your 12th NN ain’t that hard for you to get to after all, eh? 🙂 And I agree. No room for dogma here. It’s a very DIY feeling for me *and yet* I feel like my soul belongs to my tradition *despite* my affinity for other traditions. I used to poo-poo at the positive thinking philosophy. I’m also quite a pessimistic thinker. But lately a little voice says, “What if they are on to something?” I’m a little afraid to try it though. Sounds like I should get started though, with boundaries being so thin! I love that haiku. 🙂 Reminds me of my winter hike earlier, where I went back over my memory of doing the hike mid-summer.